Peralada is a town located to the north-east of Figures just off the road to Llanca. The town is the home to the castle of the counts of Peralada and Rocaberti (Rocaberti is a castle, now in ruins, close to the modern French-Spanish border at La Perthus) and the wines of Peralada, part of the DO Emporda wine appelation. 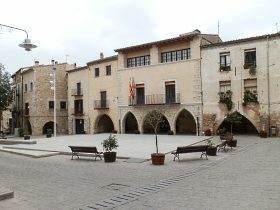 In around 1000 (so close to the time of William the Conqueror in England), Peralada was the capital of Alt Emporda. At this time Catalonia was a collection of counties (literally ruled by counts). The history of Catalonia and its formation and development is bound up with the counts of Catalonia and feudal lines of homage, caught up with marriage and alliances. The count of the County of Barcelona was the dominate county, but this did not stop disputes with counts such as Urgell or Empuries (the count of Peralada was a vassal of the Count of Empuries). Marriage between the Count of Barcelona and the daughter of the King of Aragon, lead to the creation of the Aragon empire which, at its highpoint in the 1300s included Sardinia, Southern Italy and Sicily, and even out to Athens and parts of Greece. A succession dispute led to the crown of Aragon being entwined and then finally joined with kingdom of Castille, to the disadvantage of Catalonia. As Castille rose in importance and promenence though both the discoveries in America (which were only accessible to Castillans), and the joining of the Spanish crowns and the crown of the Holy Roman Empire under Carles V - which gave Spain its Dutch and Milanese territories in Europe, Catalonia became relatively peripheral. The Castillanisation of Spain causing simmering resentment in Catalonia that eventually blew up in the Reapers Wars of the 1640s. The role of counts, their marriages and their disputes and feuds is then a key part of Catalan history. 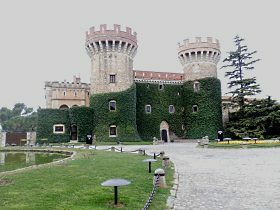 Modern Peralada has the, still privately-owned, castle of Peralada still in the possession of the original family. The current castle is was built in the 19th century on the site of the original 9th century castle in a French Chateau-style so compared to most of the Catalan castles we see which retain their medieval origins, this one is quite refined. In keeping with the Chateau style the castle has grounds and gardens. We had hoped to be able to visit, but these were closed to the public. In the summer, the castle has a museum that is open to the public, and also has a number of music festivals. The best we could do was to visit the courtyard, just off from the casino entrance - the casino is open all year around, at least to get a glimpse of the castle. The town itself is just behind the castle and has its own town walls. It is a typically Catalan town with a church on the high point, and a network of squares and small streets through the centre. The town museum has the well preserved remains of a cloister from an abbey that was in the town - you can just get a glimpse from the back streets. Unfortunately being Sunday much of the town was closed so we couldn't explore much further which meant that we just did a lap of the town. 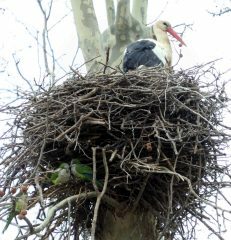 Though we did get the remarkable site of parrots sheltering under stork nests as the storks used their beaks as castanets to chatter to each other. Originally we had planned on walking direct from Peralada, but the only map we had was a 1:50,000 which doesn't give very good walking resolution and the marked paths seemed to be walks of 6-7km with no obvious circular-route back. So instead we decided to go on into the hills.